A few weeks ago, we took a family vacation to Walt Disney World (I really do mean to share the insights, tips and tricks, but I never seem to have the time). We timed our trip this year to hit the end of the Epcot Food and Wine Festival. My son, who as of late seems to be becoming quite a little foodie, wanted to try food at all the stations. We didn't get to all of them, but did hit quite a few of them. One of the first things that we tried was a Pork Slider at the Hawaii station. It was pork, a pineapple chutney, a spicy mayonnaise on a slider roll. As I was exploring the Lloyd's page on Hormel.com, I found a recipe for a Barbeque Pineapple and Chicken sandwich. I am certain this dish is not quite the same, I was thinking of starting with this recipe, swapping in Pork for the Chicken, omitting the cheese and adding a spiced up mayo to see how close we could get to the sandwich we all enjoyed at Epcot. As a Hormel Foods Extended Family Blogger, I have been invited to share with my readers 10 coupons for Lloyd's BBQ. You could try the recipe I mention above or any number of recipes featured on the Lloyd's page or simply enjoy them as sandwiches (also good just served up 'open-face' on crackers). Giveaway will remain open through December 5th. Winners will be selected through Rafflecopter. The winner will have 24 hours to respond or a new winner will be selected. Coupons are only good until 12/31/14 and will be mailed to the winners. A Busy Mom of Two is not responsible for lost or misdirected mail. I would like to try the Barbeque Pork and Spinach Flatbread. I would like to try the Seasoned Pork with Barbecue Sauce. The BBQ Pork nachos look yummy as does the Barbeque Chili and Cornbread recipe! I'd love to try the Barbeque Pork Melt! i want to try the Barbecue Breakfast Burrito!! I'd like to try the Bacon, Eggs and Asparagus! I'd like to try the barbecue pork burgers. The Barbeque Pork Sliders sounds good to me! The grinder sandwich sounds good. My favorite is the recipe for the barbecue chicken calzones. I'd like to try the lentil and ham soup! I'd like to try their recipe for Mini BBQ Pizza. It looks easy and delicious! The bbq chicken and pineapple bunwich sounds like something I'd make! I'd love to try the Mini Mexican Chili Bites recipe - thank you. I would like to try the Barbecue Breakfast Burrito. BBq Chilli and and cornbread...mmm! I would like to try the Chicken Enchiladas, thanks! I would love to try the BBQ pork Nacho's ymu! I would try Seasoned & Shredded Pork in Honey Hickory Sauce. I would like to try the bacon and eggs asparagus! 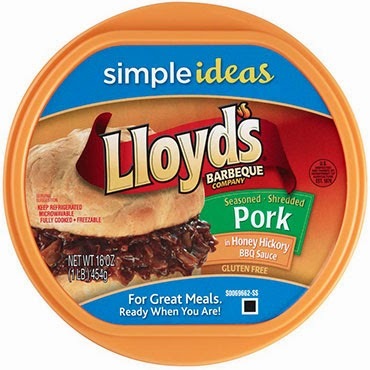 Slow Cooker Pork Tenderloin sounds like a good recipe from Lloyd's. The recipe I would like to try out is the Ham, Provolone and Basil Strata. I'd like to try the bbq pork melt recipe. Mmmm....I'd love to try making their bacon bowl mac n cheese recipe. Yum. My family would love the Barbecue Pork Melts! It looks like a nice weekend dinner. Thanks! The BBQ Pork Melt looks amazing! I can see us enjoying some mini bbq pizzas with our holiday movies and a nice bottle of wine this month! My guys would love the Bacon Bowl with Mac & Cheese. It is both of their favorite foods. We would like to make the BBQ pork nachos. I bet this would also be good to make BBQ baked potatoes with. I'd like to try the BBQ Pork melt on ciabatta bread. I'd like to try the BBQ Pork Nachos. The BBQ Pork Nachos look amazing! I would love to try the Ham, Provolone and Basil Strata. I would like to try the barbeque flat bread sandwich. I couldn't take my eyes off of the bbq pork melt. I think We will be having this for dinner tonight. I would like to try the Chicken Enchiladas. I know my family would love them. I commented under my google name (katja9_10). Oh my goodness, those BBQ Pork nachos look BOMB to this pregnant mama! The Barbecue Pork Melt looks delicious! Thank you very much! That BBQ Pork Melt on their front page sounds so delicious and easy to make. I also like the Chili Mac n Cheese Bake. I would like to try the chicken bbq calzones. Sounds yummy. I would like to try the recipe for Croque Monsieur. I'd love to make their Bacon Wrapped Meatloaf! Asian-style Chicken Lettuce Wraps sounds so good. I think the barbecue crescent bites look incredible would try those first. And then all the others. bacon bowl mac n cheese! I would love to try the BBQ Pork Melt. I just bought this product yesterday, so now I have a new recipe to try with it! The Sunshine Hash recipe sounds good. The Barbecue Breakfast Burrito looks tasty! I would LOVE to try the BBQ Chili & Cornbread! We have chili and cornbread often, it would be nice to change things up! I bet I would LOVE the Seasoned Pork with Barbecue Sauce.